Phoenix Hits 119 degrees on June 29, 2013. Sets record! Carefree (PW) As a massive high pressure area built over the West, it seemed nobody was immune from record-breaking temperatures that scorched from Idaho to the Mexican border. There were even traffic tie-ups at Sky Harbor Airport as jets were unable to take off with full loads of fuel. Carefree and Cave Creek clocked in with rare 112 degree readings. With over 70 days of no rain, the Monsoon's arrival next week should provide some welcome relief. Black Mountain Eyes! Twice a year, near the solstice, we've noticed early morning light reflecting off two windows on a residence high in Hawk's Nest. It's always an intriguing sight before it disappears in an instant! 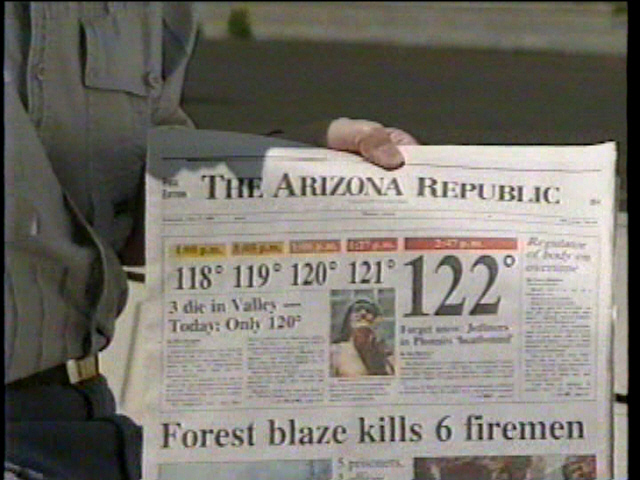 Phoenix hit 122 degrees back in June, 1990. Why were they lucky?Scroll down for the answer! Cave Creek (PW) For tourists exploring the area North of Cave Creek, ambling to the end of Sierra Vista Road, where they are confronted by a closed gate, most would have no idea of what history was involved at the small ranch ahead of themtten, or what that very long green building is up on the hill to the South. Yet, in history books such as Frances Carlson's Cave Creek and Carefree, Arizona-A History of the Foothills, there are chapters written about what went on there. 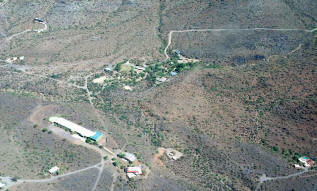 Note the green area near the top of the photo, is the Sierra Vista Ranch. According to experts at the Saguaro National Monument near Tucson, "even when saguaro cacti grow in their normal form, they rarely grow symmetrically. Saguaros sometimes grow in odd or misshapen forms. The growing tip occasionally produces a fan-like form which is referred to as crested or cristate. Though these crested saguaros are somewhat rare, over 25 have been found within the boundaries of the Tucson park. Biologists disagree as to why some saguaros grow in this unusual form. Some speculate that it is a genetic mutation. Others say it is the result of a lightning strike or freeze damage. At this point they simply do not know what causes this rare, crested form." Carefree Town officials are hopeful that this latest find will prosper in the million-dollar Cactus Garden, which has has become a huge tourist draw. Thanks for reading our blog! Check out our Fall Issue for the latest news and special events for our visitors! Carefree (PW)- It was a fiery buying season that turned cold this summer, when inventory got tight and the seasonal buyers departed, as usual, after May 1st. But with Phoenix home prices continuing their double-digit climb, there was a panic sense of buying with empty shelves at the store. Take the case of the Montana couple, trying to pick up a good deal on a lock-and-leave home in the area, but frustrated by HOAs and their parking regulations. After getting a local home under contract, they found out that their truck wouldn't fit in the garage. The HOA edict said that if they couldn't park it in the garage, it had to be parked at a community parking area, about a mile from the house, as overnight cars in the driveway were not allowed--clearly not a reasonable choice. After much soul-searching, they cancelled the deal during the inspection period, and flew back to Montana to wait for something to pop-up. Amazingly, two days later, a home in Terravita was about to come on the market with what looked like a larger garage, and they jumped in the car and drove all the way back to Carefree, to await the home's first open house the next day. With a filled-in contract and check in hand, they arrived at the home, in their truck, to see what the residence was like, and do an on-site fitting for their vehicle. Turns out that the truck was several inches too long and the house wasn't as nice as the pictures anyway. Back home they went. At this writing, the couple has driven down from Montana twice now, both times returning empty-handed on a home. This is what a lack of inventory does, especially to buyers looking for the bargain prices of several years ago. Most agents were astounded at the run on houses, fueled by prices about to leap-frog up, and record low interest rates. When the buying spree was over, as the heat hit, I think there were a lot of buyers forced to go home and play the same waiting game. Offbeat andOdd Carefree Rock Formation not on the Chamber's "Official" List! Stop in at the local chamber, and ask what sights you should see in Carefree, and you'll probably be directed to the town's enormous Sundial, or maybe the adjoining million-dollar cactus garden and $17 million-dollar Town Center with free WiFi. You might be encouraged to take the scenic drive along Stagecoach Pass Road and see Rusty Lyon's house on the rocks, used in several movies. 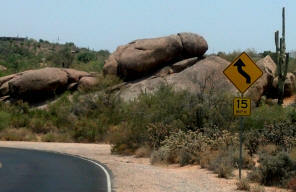 But you can bet you won't be directed to see the Phallic Rock. Although mentioned in Wikipedia, and on any number of tourist blogs and websites, this scintillating sculptured rock by Mother Nature, even has a handy pull out to use, on Stagecoach Pass. Wikipedia even furnishes more information than you might want to know. . . "a precambrian granite rock formation in Carefree, Arizona, United States. The formation is caused by spheroidal weathering whereby the composition of the granite and its crystal structure facilitated the development of rounded corners and its unique tubular shape. The formation is at the eastern foot of Black Mountain and can be found approximately 400 feet east of Tom Darlington Drive on Stagecoach Pass Road. The formation is best viewed from the western side looking east. 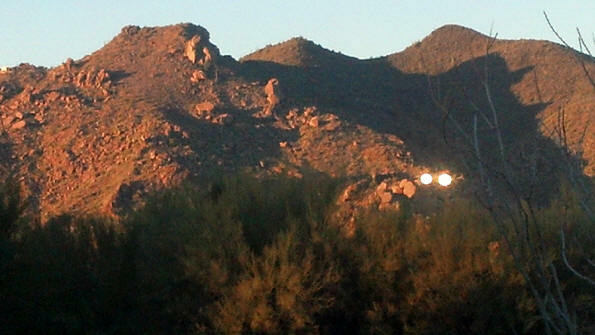 There is a dirt pull-off on the side of Stagecoach Pass Road with enough room for several vehicles." Phoenix Area Housing Prices Continue to Head Up! Metro Phoenix’s median home-sales price climbed to $175,000 in March, a 3 percent increase from February, according to Arizona State University’s report released Friday. Home prices have climbed 30 percent in the past year and are expected to keep climbing until at least June. January to June is considered the peak buying season in the Phoenix area. Prices have not yet risen high enough to entice a larger number of the region’s homeowners to sell. More sellers could help balance the market. The number of houses listed for sale is down 8 percent from a year ago. He said 80 percent of the houses for sale are priced above $150,000, making it tough to for both regular buyers and investors to find affordable homes. But Orr said most houses priced below $600,000 continue to attract multiple offers. Some housing market watchers are concerned that home-sales prices are climbing too fast. However, the region’s median sales price is still well off the peak price of $267,000 from mid-2006. The Valley’s rising housing prices have deterred some investors, who can now find better bargains in other parts of the country. About 27 percent of all houses purchased in March went to investors, the lowest level in several years, according to Orr’s report. Demand from buyers is expected to keep increasing this year because of population growth. Metro Phoenix is on track to add 50,000 to 60,000 new residents this year. New-home sales have climbed 37 percent in the past year, but Orr said that’s not enough to meet the demand for housing. Why was Phoenix lucky the day it hit 122 degrees, years ago? Weather forecasters were astounded on this day. The temperature in Phoenix had rocketed to 118 degrees before 12 noon. Something very wierd weather-wise was going on. But around 2 pm, a sudden bank of high clouds blew in over the Phoenix area, which proved to be a Godsend. The temperature rises slowed, and stopped at the 122 mark. Professional meteorologists predicted that the record could have been even higher on that memorable day. By the way, the front page you see is the only one the Arizona Republic paper managed to save. The publisher was amazed they didn't store hundreds of the memorable headline, but apparently everybody made off with one of the keepsakes. The lone paper left was put in their museum!